Ah, Monday, Monday … Rarely anyone’s favorite day, although it will be a good Monday three weeks from now, with the Cardinals home opener at Busch Stadium. But that’s jumping ahead. Right now, it’s only 13 days until the beginning of the 2015 Cardinals season on ESPN’s Sunday Night Baseball against the Cubs at Wrigley Field. Is 13 a lucky number, or an unlucky one? Your view might just depend on the circumstance. For me, my first trip to the current Busch Stadium in April 2006 involved that year’s No. 13. And it was both unlucky and, I suppose, lucky. It definitely was a fun game, as the Cardinals had 11 hits and scored nine runs and beat the Reds 9-3. So Taguchi doubled! Hector Luna hit a homer! Ponson had a quality start! Who cares that we didn’t have the best seats — way, way in the upper deck down the right field line with a great view of the foul pole? At least we were in Busch Stadium III during the first-ever homestand. And so what if — now the unlucky part — I’d just missed out on seeing Chris Carpenter pitch in a 1-0 game by about 18 hours? Yes, sad but true. It would be three-plus years after that before I’d see my all-time favorite Cardinal pitch in person (though the start was certainly worth the wait). Knowing Carpenter was pitching on Friday night, though, prompted me to drive to St. Louis that afternoon. Maybe I’d be able to buy a scalped ticket … Or at least I could explore the area outside the new ballpark and hang out. Having people hang out there was obviously part of the plan then — there was even a beer stand set up right on the sidewalk. So I bought one and peered through the gates and chatted with a guy standing there also. He was a Reds fan, but still nice to talk with, which we did as we drank beer after beer. And we were eagerly trying to see whatever we could of the game, when we could actually view the outfield between the people who were constantly standing behind the left-center field bleachers or walking around. A lesson I learned that night: pitchers’ duels — while my favorite type of game — do not provide anything to view when you’re standing outside the ballpark. Another lesson: there’s no place to go to the bathroom when you’re outside the ballpark, which is kind of a necessity when you stand drinking beer for a couple hours. By about the sixth inning, after Reds Guy had a chance to cheer when Harang singled in the game’s only run in the fifth (yes, really), I had to leave … because I really had to go. So I walked the block or so to my hotel and found the bathroom in the lobby and decided to just watch the rest of the game at the bar there. CC pitched eight innings, gave up only four hits and that lone run … and was the losing pitcher. Scott Spiezio pinch-hit with one out in the bottom of the ninth — there’s the tying run! — and then Yadi grounded into a double play to end the game. I’ll bet Chris Carpenter said some bad words that night. I know I did … even if it was Good Friday. The next day, I was at the ballpark early and eagerly waiting when my friends from Springfield, Ill., arrived with the tickets. And obviously we saw a much more action-packed game — the kind I had hoped to see when outside the ballpark the night before. Ah, well. I was lucky enough to see a Sidney Ponson Cardinal highlight. Maybe even the only one. He might be happy to know it made an impression on me — so much that I’m writing about him, out of all the No. 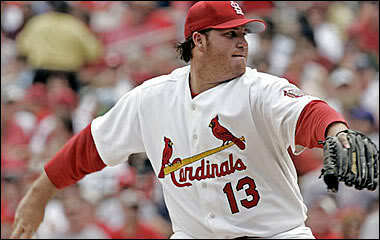 13s in Cardinals history. And now just 13 more days! This entry was posted in 2015 Cardinals and tagged Chris Carpenter, Countdown to Opening Day, Scott Spiezio, Sidney Ponson by Christine Coleman. Bookmark the permalink. My first game in the new stadium was years later in 2011. April 24th, a Sunday night game against the Reds shown on ESPN. It started raining later in the game, but it was a light rain, so there was never a delay. I had seats behind home plate at field level, about 20 rows up. It was scoreless until the 6th inning, when Yadi hit a 3 run homer off of Edinson Volquez. The Cardinals won 3-0. My first game seeing Carpenter pitch was in September of that year. Sept 7 against the Brewers. That was the game where Nyjer Morgan threw his wad of chew at Carpenter and the benches cleared. Morgan had been taunting Carpenter earlier from second base after he hit a double off him. I guess it pissed Carp off, so when he struck Morgan out later he said “F—- you” to him and Morgan threw his chaw. It was the first scrum I had seen live. No punches were thrown, but it was fun anyway. I was also at an NLCS game against the Brewers that year. We lost that one, but it all ended well. Oh, I remember how furious Carp was that game — and how much of an idiot Morgan was.